Our good friends at Equinox Records are about to celebrate their 25th release, and to commemorate this milestone they’re doing what they do best – putting together an amazing physical package of vinyl and more. The box set features a 7 inch, a unique, custom USB stick (for the first 50 sets) and a tape featuring megamixes by long time Rhythm Incursions friend and collaborator Buddy Peace and Phonatic! The megamixes (which you can download below digitally) are quite special too with label boss Scientist giving Buddy and Phonatic access to separate layers, vocals and more from the label’s first 24 releases allowing them to create a truly intricate sonic experience. Anyone who knows what Buddy is capable of when it comes to mixes will know that this is an absolute must listen! Limited to 250, the box sets come in normal and deluxe packages and are available to buy now from HHV and all good stores (check the links). Click here to visit the Equinox site and get the full details of what is included – tape, 7 inch, digital package and USB stick. It’s a truly killer release. 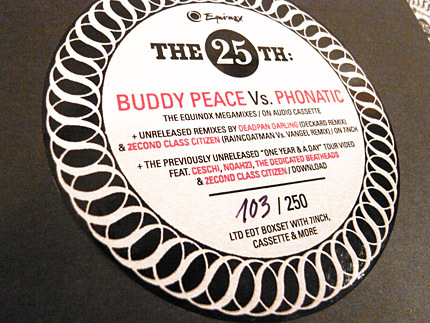 As for the freebie, it’s a high res version of the Buddy Peave vs Phonatic megamix (which is only available on the cassette as part of the box set) – check the link below to grab the zip file. And you can also check a new remix of 2econd Class Citizen’s ‘Wishing Well’ by The Raincoatman and Vangel which is available on the box set’s 7inch. Congratulations to Scientist and the team for reaching 25 and here’s to the next lot. Much love! This entry was posted on Saturday, October 30th, 2010 at 5:25 pm. It is filed under Downloads, News and tagged with Buddy Peace, 2econd Class Citizen, Equinox Records, DJ Scientist, Phonatic. You can follow any responses to this entry through the RSS 2.0 feed.